Note: The latest version of this effect is The Internet Lie Detector (2.0). You bring an unsuspecting co-worker into your office or cubicle and say "Check out this website! Some guy at this university actually figured out how to make a LIE DECTECTOR on the Internet! It's awesome!" etc. etc. Note: this site won't appear to be functional until you read the rest of this document. When you get to the website, you follow the instructions on the first screen (shown to the left) which tells you to select a random card. You ask your co-worker to name a favorite playing card. She writes the name of this card on a post-it and sticks it to the monitor while you proceed to the next page by hitting the "next" button. 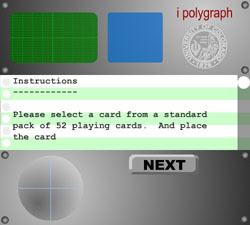 The next screen (shown to the right) provides further instructions about operating i polygraph. 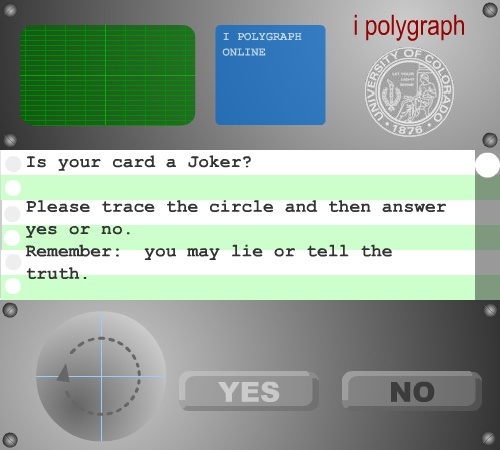 Before answering each question you are supposed to draw a circle on the lower right of the screen - this is how the polygraph determines if you are lying or not. You read these instructions and then continue on to the next page by hitting the "next" button. The next page contains the first question: "Is the card a joker?" You ask your co-worker which answer she wants to use, "yes" or "no". As instructed, she may tell the truth or lie at her own discretion. You prepare to answer the question and then say "Hmm - actually YOU should be doing this..." (meaning your co-worker). You then vacate your chair, and put your co-worker in the drivers seat. From here on out, you don't touch the computer. Your co-worker now responds to the computer's questions. When answering each question the co-worker must trace a circular shape on the left side, and then press the YES or NO button. The co-worker is free to lie or tell the truth. When the coworker hits YES or NO, the program performs an elaborate visual analysis of the drawing the co-worker made. Amazingly, the computer does indeed determine correctly if the co-worker is lying! After about 3 questions, it will figure out the correct card and reveal it! Later, when your co-worker visits the same website, and attempts to use the service, she will get a message which says "i polygraph is offline for a software upgrade between the hours of 4 p.m. and 6 p.m. Sorry!" - the time shown will always correspond to the current time. 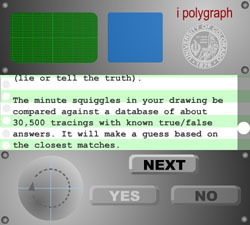 i polygraph is a Flash application written by Jim Bumgardner. It is based on his original effect The Internet Lie Detector which was scripted using HTML and Perl. Needless to say, the program is not a lie detector. Rather, it already knows the card once the yes/no questions start, because the magician communicates this information to it during the first two mouse clicks (which were used to wade thru the instruction screens). Note: This is an older version of the effect. The latest version of this effect is The Internet Lie Detector (2.0). 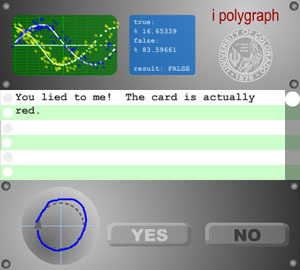 To use i polygraph, you must first unlock it. Note: A big thank you to professor/magician David Scollnik who teaches at the Math department at the University of Calgary, for providing the institutional imprimatur! The first screen contains some introductory text and has a single "NEXT" button. To unlock the trick, you need to click just outside the button (or on the beveled edge of the button), but not on the inside of the button. If you click on the inside of the button, the trick will "lock" and it won't work properly - you'll get a message about the service being down for upgrades. This is to help prevent your friends from figuring it out. When the trick is unlocked, you will then see the first instruction screen asking you to select a card and write it down on a piece of paper (if you have a deck, you may force a card on the spectator, if you like, then you can make the trick appear to work without actually seeing the card.). This screen also has a "NEXT" button at the bottom. When you press this button, the script pays attention to where inside the button you press. The button is divided into 8 sections, as shown here. Low cards are Ace-6 and high cards are 7 and up (7 and 8 may be coded either way). The following screen (which provides the instructions for tracing the circle) also has a "NEXT" button, which you must click on to communicate the remainder of the information. Note that jokers are considered high cards. After inputting the card, you will be asked the first question: "Is the card a Joker?". From here on out, you may give the mouse to the spectator, because the trick is self-running from this point. Once the trick is over, wrestle control back from your co-worker by feigning an interest in actually getting some work done. Reveal nothing and don't do the trick again! If you *MUST* do the trick again (and you really shouldn't), you can reload the page.